This FREE resource was written as a supplemental activity pack for THE GIRL WHO THOUGHT IN PICTURES by Julia Finely Mosca. Based on the life of Dr. Temple Grandin, this book shows that people born with autism are different, not less. Dr. Grandin grew up to be a scientist and encourages all children to find new ways to discover and explore the world. There are so many ways that a child can discover the world through science. 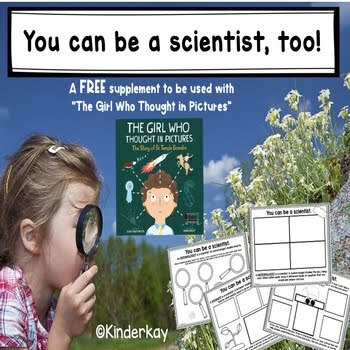 This resource includes four activity sheets that encourage children to be their own backyard scientists. METEOROLOGIST, ZOOLOGIST, BOTANIST, and ENTOMOLOGIST are the scientific areas included on the activity sheets.